This girl is certainly no Tiger Woods. In fact, I have never even been golfing in the truest since of the word. You need not be a golfer to have fun at an event that has begun in Danville, Indiana, called Play-A-Round Downtown. 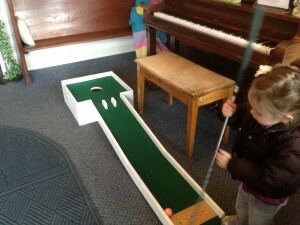 The Downtown Danville Partnership with the cooperation of several local businesses has set up a fun miniature golf experience inside several of the local establishments. Best of all, this great family fun activity is totally free, includes great grand prizes and continues through April 13. Joining in the fun is easy. Simply gather friends or family and head to Danville. It doesn&apos;t matter where you start Play-A-Round Downtown, but make sure to pick up a scorecard at your first stop. Each location has them. Also, make sure to get a scorecard for every player who participates. 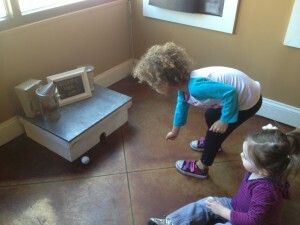 We began our golf adventure at the Beehive. Every good golfer has to have their coffee right? So we started with a few sweet treats, and I grabbed a Nutella latte. The Beehive had a really cute setup that my daughter enjoyed. Since it was her first time putting and she&apos;s only 2, she didn&apos;t truly see the need for a putter. Her and her friend decided they would much rather roll the ball. It eventually ended with my daughter simply walking up and placing it in the hole and proclaiming, "I did it." In fact, that is the best part of this adventure. You can go to as many or as few locations as you wish with as few or as many players as you desire and simply have fun. We made our next stop on the Square at Diggity Gourmet Dawgs. 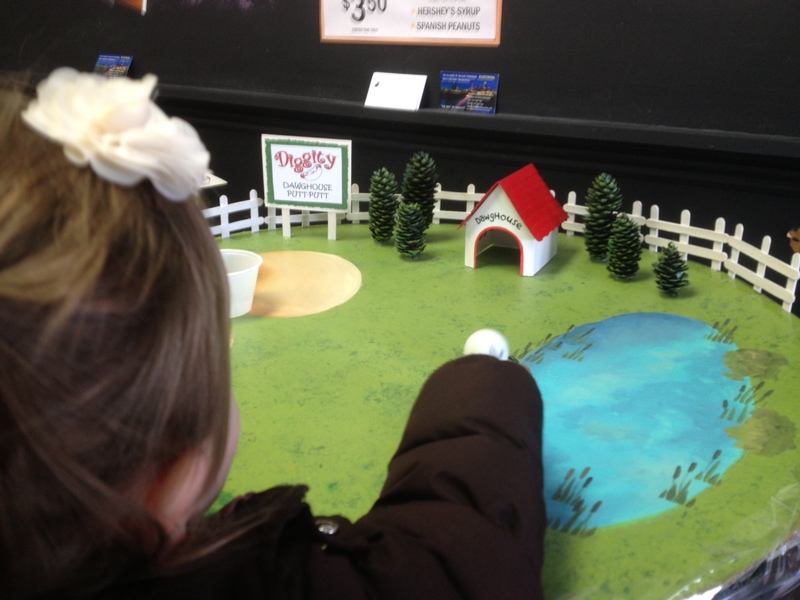 This location really did have more of a roll-it setup as their hole was designed on a table top bringing new meaning to miniature golf. While this might seem easier at first glance, neither of us made a hole in one here. We then headed to the Mayberry Cafe, our last golf location on this day. Mayberry actually had a great little hole. My daughter got really excited and decided to take a few swings. She missed the ball several times but enjoyed every second! Other Play-A-Round Downtown locations include: Sycamore Printing, Hendricks County Historical Museum, Visit Hendricks County, Danville Public Library, Amen Affordable Bakery, Gallery on the Square, Carla&apos;s Creations & Gifts, Confection Delights, State Farm Insurance, The Locker Room, Safe Hiring Solutions, The Bread Basket Cafe & Bakery, Jane&apos;s On The Square, Danville Veterinary Hospital, The Royal Theater, Court House Grounds, Heat & Cool LLC., The Town of Danville & The Danville Fitness Center. In order to enter the grand prize drawing, you must complete at least 18 holes. Since we had a short round of golf, I plan to keep our cards and possibly return before April 13 for more fun. The "club pro" at each location must stamp and date your scorecard. Completed scorecards can be left at any participating merchant location to enter the drawing for the grand prize. What are the grand prizes you ask? Ages 16 and above who complete 18 holes can win a $500 VISA gift card. 15 & under can enter to win a $100 Visa gift card. Not good at putt putt...no worries score doesn&apos;t matter for eligibility. So whether you have a free afternoon coming up or just an hour or two to fill, head to Danville and join in the fun of Play-A-Round Downtown. Not only is it a great, family-fun activity, but it&apos;s great to get out and learn more about the local businesses that Danville has to offer. Not to mention...who doesn&apos;t want a chance at a $500 gift card! Let the games begin! !